I hadn’t actually looked at what I had posted yesterday until I posted this photo. I am happy to see that I did actually change some things. Still need to tweak a few things, put in the separation lines… all in all though, I think this is it. 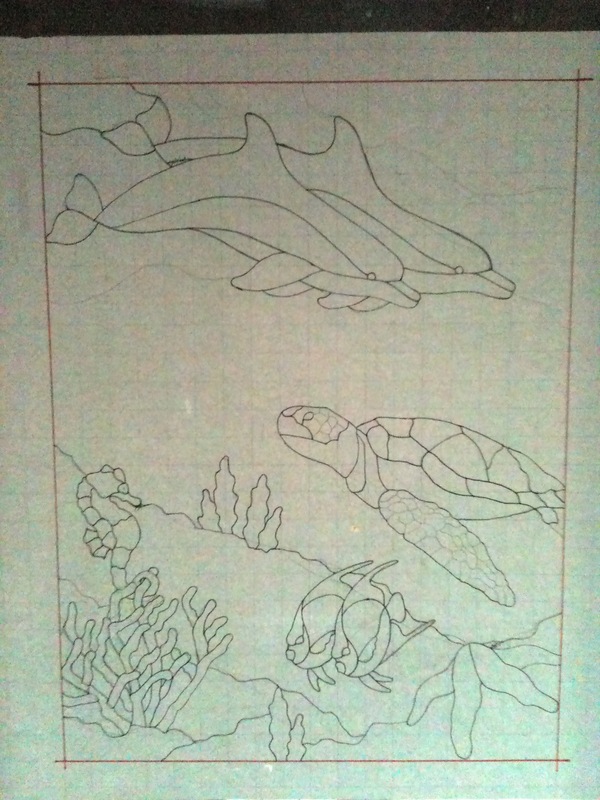 I took elements from several different pattern books (Tropical Waters by Leslie Gibbs [a CKP publication] and Marine Animals Stained Glass Pattern Book by Carolyn Relei. the turtle is from someone else… i can’t remember who… I went through almost every book I own, looking for inspiration) and mixed them up, changed a line here or there. I’m not really happy with the dolphin tails, I might have to fiddle with them some more. I was hoping to use some of the wave elements from my humpback whale piece (which is all original except for the whale itself) but it didn’t work out. Anyway, the point of this post is that making pattern is fricking hard! It takes hours, literally. There is drawing and erasing, and more drawing and erasing… repositioning stuff, moving it around, adding, discarding. Every element in the pattern was drawn and erased at least once. those two fish i drew, erased and re-drew 4 times. 4!! The starfish was changed three times. I repositioned the coral once, the seahorse 4 times… and lets not even get started on the turtle. I moved that sucker all over the place. The dolphins could really only go one place, so that was relatively easy. (oooh, a skunk is going by outside. hello, Stinky, lol). When its done, though… very rewarding. Hopefully, K still wants the window, lol. I drew out he lampshade pattern. That one was easy. It’s actually much larger than I had anticipated. To get good positioning on the light, the shade needs to be 10″ long… that will end up being a lot of glass. But it will look super cool, and I think it is something I will be able to knock out in a couple of days. Need to hit up Makin Glass for some soft spool lead for the top and bottom edge, and for the wood framing for the coven repair. I took a long nap today, so I am wide awake. It’s midnight, or almost. I think I’ll go grocery shopping. ~ by kellig on April 30, 2012.